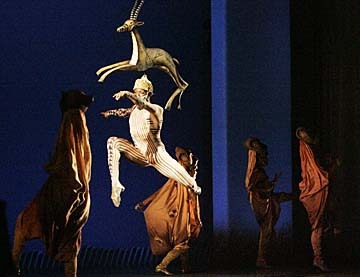 A dance number called "Lioness's Hunt" is part of the "Lion King" show. Disney's "The Lion King" is definitely the big fish in the local community-theater pond. But with limited dollars available for nights at the theater, the lion's claws have certainly raked through the cash drawers of local companies. "Dreadfully low" is how one theater manager described box-office receipts. Not everyone blames "Lion King," and some say the overall effect will be positive as families discover the enjoyment of musical theater. But in the short term, said Marty Myers, theater manager of Kennedy Theatre at the University of Hawaii-Manoa, audiences need to remember that local productions need local support. "As theater professionals we are all excited to see 'The Lion King' in our community, but Honolulu needs audiences that are willing to support the community's work as well as the theater spectaculars than come to town." 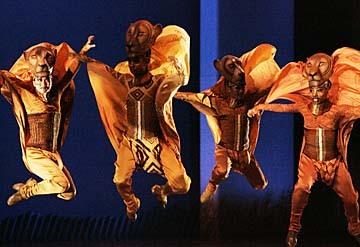 Dancers performed "Lioness's Hunt" during a showing of the "Lion King." The King is in town -- "Disney's The Lion King," that is -- and as in years past, when touring company productions of "Les Miserables" and "Phantom of the Opera" played Honolulu, community theater groups are feeling the impact in differing ways. Does a "family show" that comes to Hawaii for a three-month engagement with a top-end ticket price of $150 boost interest in local companies -- or does it take badly needed money and media support away? A survey of Oahu's many stage troupes shows that both effects are true. Tom Holowach, manager of Paliku Theatre at Windward Community College, says the impact was "even worse than we anticipated" on ticket sales for his production of "The Pajama Game," even though that show opened several weeks before "Lion King" came to town. "We naively moved the (performance dates) from October to August, thinking that would alleviate some of the conflict, but the dates were irrelevant. The issue was the disposable income of the theater-going public and how they chose to use it. It was a foregone conclusion that 'LK' would affect us, we just didn't expect to be hurt so badly." Holowach said ticket sales were down about 50 percent and his usual patrons told him why. "We heard directly from them apologizing for not buying tickets, or not buying as many tickets as they usually do, saying that they had bought their 'Lion King' tickets and that was all they could afford right now." "Pajama Game" lost thousands of dollars, he said, and a planned fifth weekend of shows was canceled. "The Pajama Game" at Windward's Paliku Theatre was a ticket-sales casualty of powerhouse "The Lion King," top. Things are similar but different at Manoa Valley Theatre, where producing director Dwight Martin says the season-opening "The Musical of Musicals: The Musical!" "under-achieved what our (sales) goals were." He said he was disappointed, but that it's hard to blame "Lion King." With all local theater groups starting their seasons in September, he said, MVT has been experiencing declining sales for its opening production for three years. "It would be my guess that ('Lion King') has had some minor impact. There might be student-age people, or people on are on a little more fixed income that may have to choose A or B, but I don't think that's the case for the majority of our patrons." When patrons must make a choice, "Lion King" does have the advantage of name recognition, he said. "We're finding it more difficult each year to promote and market shows that the local audience has not heard of. ... If (a show) is not in the working vocabulary of our Hawaii-based customers, there tends to be a greater proclivity now than there was 10 years ago to shine it on -- and who hasn't heard of 'Lion King'?" Vanita Rae Smith, producer/director at Army Community Theatre, takes the positive approach that "Lion King" is creating converts to live musical theater, even though she's seen a significant drop in season ticket sales. Attendance at ACT's season-opener, "Once Upon a Mattress," was "dreadfully low," she said. "I really didn't think at first that 'Lion King' would hurt us too much, but after 'Mattress' I'm afraid that maybe it did. Our attendance was probably the lowest we've had in 10 years for any show." But Smith is hoping for an increase in the months after "Lion King" closes, as happened after "Les Miz" left in 1996. "What I'm hoping for is people walking away from 'Lion King' and saying, 'Gee, that was theater, and it was good!' ... and we're going to feel the upswing afterwards." Marty Myers, theater manager of Kennedy Theatre at the University of Hawaii-Manoa, said the recent production of "Kraken-Ka" played to "almost nonexistent" audiences despite good media coverage and even though the show "follows in the 'Lion King' tradition of puppetry and family theater in many ways." Yes, "Lion King" has renewed interest in live theater, she said, "however the box office has been dead. ... Do people have way too many things to do on a weekend, such as watching or going to UH football, to attend a play? Whatever (the reason) is, it is not a good omen for the survival of live theater in our community." Honolulu Theatre for Youth has fared better. HTY performs primarily for a guaranteed audience of schoolchildren, but public performances are held on weekends. HTY managing director Louise King Lanzilotti says support is up. A good live theater experience such as "Lion King" makes families more inclined to try HTY, Lanzilotti says. "Our family audience is growing, we've had good fall audiences so far, and they didn't fall off when ('Lion King') opened. They're strong right now." Scott Rogers, managing director of Kumu Kahua, which specializes in productions about Hawaii, many written by local playwrights, says plays like "Lion King" and "Les Miz" can help build interest in theater overall. "I really think that (shows like 'Lion King') get people away from the TV set, and I find it to be a positive thing. It's a spectacle, it gives us something to shoot for in terms of the quality of our musicals, and so it think it's a good thing for us."